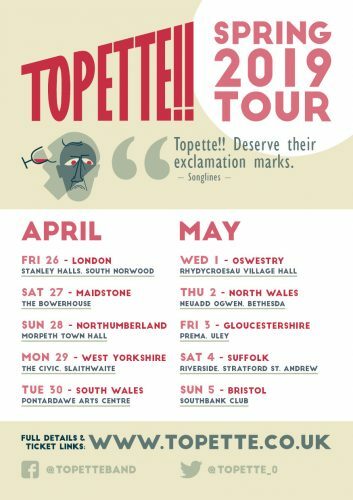 Anglo-French acoustic five-piece, Topette!! return to the UK for a spring tour in April / May 2019. 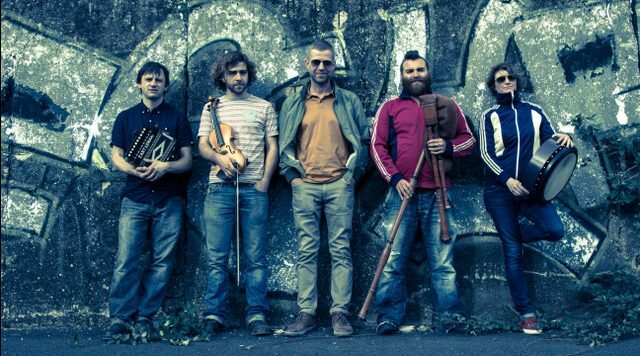 This band is a must see, for anyone interested in traditional European dance music, for folk fans, French dancers and discerning listeners alike. The band’s debut album, C’est le Pompon… was well received across the continent, and they have continued to thrill audiences, with their unique, energetic take on instrumental folk tunes. This tour will see the band firing on all cylinders, as they prepare to make their second album, Rhododendron, to be released later this year. Featuring the peerless diatonic button accordion maestro, (and multiple BBC Radio 2 Folk Awards winner), Andy Cutting, alongside the “enfant terrible” French bagpiper and banjo plucker, Julien Cartonnet, with James Delarre on violin, Tania Buisse on Bodhrán and Barnaby Stradling on acoustic bass guitar, these guys and gal are literally having a ball ? !